Hello all! If you have come by to see what’s going on, then your in luck! SQL Saturday Phoenix 2016 is coming to you live on Saturday, April 16, 2016. SQL Saturday Phoenix is a free training event for SQL Server professionals and those wanting to learn about SQL Server. This year’s event will be held at Grand Canyon University located at 3300 West Camelback Rd. Phoenix, AZ 85017. 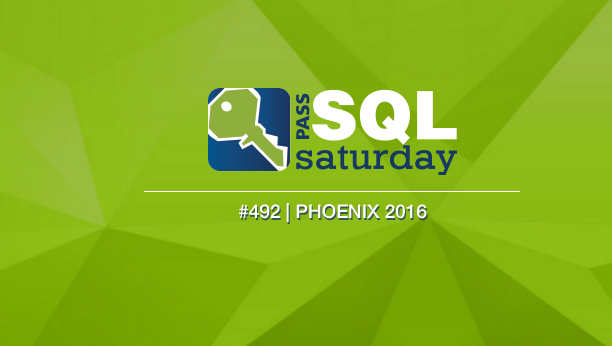 All that is required of you, is to go to the SQL Saturday Phoenix 2016 website and register for the event. The SQL Server Users Group Officers work diligently to make sure this is the best SQL Saturday event in the world! These guys really work hard behind the scenes to make this ALL happen. So as both an attendee and a speaker, I really appreciate what you guys do! Additionally, a BIG “THANK YOU” to all of the sponsors who have provided their support for this year’s event. We can’t do it without your continued generosity and support! There are a lot of talented people that will be speaking and providing sessions on an array of topics. There is content and sessions for all levels. However, I am going to take this opportunity to promote some of my Pragmatic Works family members who will be speaking. A full list of all the sessions can be found here! At SQL Saturday Phoenix 2016, I will be delivering a session titled Introduction to Data Factory Service. Today’s data landscape for enterprises continues to grow exponentially in volume, variety, and complexity. It is more diverse than ever with on-premises and cloud-born data of different forms and velocities. Data processing must happen across geographic locations, and includes a combination of open source software, commercial solutions and custom processing services. The agility needed to adapt to today’s changing Big Data landscape is an opportunity to merge the traditional EDW with capabilities required for a modern information production system. The Azure Data Factory service is the composition platform to work across traditional EDWs and the changing data landscape to empower enterprises to leverage all data that is available to them for data-driven decision making. The Azure Data Factory service empowers enterprises to harness this diversity by providing a platform to compose data processing, storage, and movement services into information production pipelines, and manage trusted data assets. See you at Phoenix SQL Saturday!